Today’s card comes from the Gilded Tarot by Ciro Marchetti and Barbara Moore. 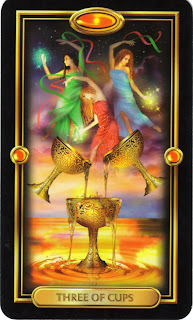 It is a card of overflowing emotions, celebrations with family and friends, and a time to rejoice and have fun. If it sounds familiar, it's because it was out Intuitive Tuesday card in mid-January. For more details about this card, click here. In addition, you'll see another artistic rendition of this beautiful card. 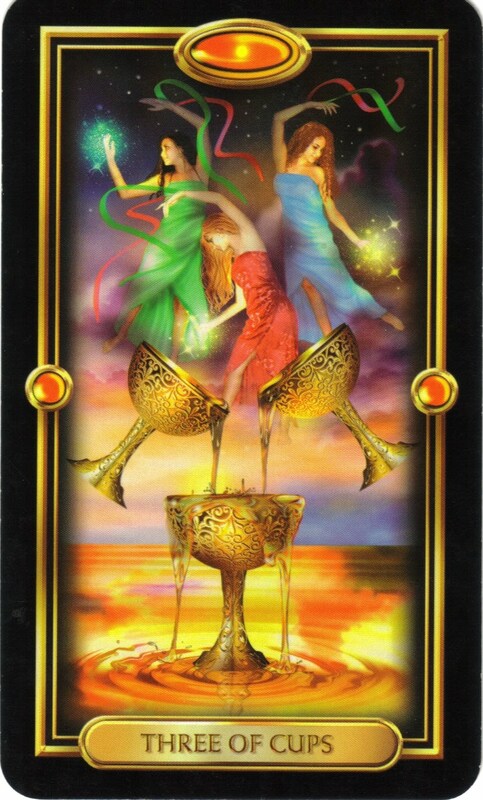 The Three of Cups is a perfect card for this time of year. Spring is a time of celebrations to mark beginnings and endings including both graduation and weddings (among many others). It's not surprising that it came up today to remind us to step into this exciting and fun energy and realize how important it is to get together with family and friends and celebrate important times in our lives. Today's card is Simplicity...which I also thought was fitting for today. As we move into this time of celebrations, it's easy to get caught up in what must be done to prepare for a successful event...that we can lose sight of the fact that it is supposed to be fun! It is useless to complicate anything. I cease to view life as a burden and to fall into the chaos that the mind creates. I choose to simplify my life and rise above the ego that seeks always to understand, prove, control, and separate me from the things that are of the Light. All that I undertake, I do with humility and an open heart. As through the eyes of a child, I discover life with wonder and simplicity. I think our message today is simple: Have fun, relax...and keep it simple! Nice cards - great advice! Know what this card says to me? Time to have some wine with your 2 sisters! Keeping it simple is always a good message! In this busy life that seems to engulf us all at some time or another, it is easy to lose perspective! Thanks for the reminder.